Speaker, 2008-2013. Acting Speaker, 2006-2008. Member for Moore, 2008-2013. Member for Greenough, 2005-2008. Western Australian College of Agriculture - Morawa: Board Member, current. Chair, North Midlands Education Industry Training Alliance, since 2014. Geraldton Universities Centre: Deputy Chair, since 2013. Chair, Hollomby Foundation, since 2014. Other: Chair, Advisory Group, headspace Geraldton, current. Chair, Rural Health West, since 2013. 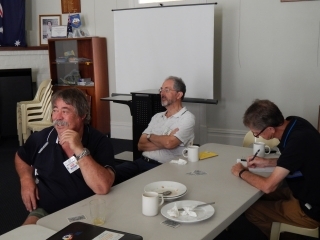 Member, Rotary Club of Geraldton-Greenough, current. President, Chapman Valley Football Club, current. Saturday Sports Presenter, Radio MAMA, current. Radio Presenter, ABC Western Australia, 1980-1986 and 1994-2003. Board Member, Geraldton Residential College, current. Director, WA Country Football League, current.